View of the interior of Surrey Chapel on Blackfriars Road in London. It has a non conventional polygonal shape with the pulpit in the centre. It was built 1783 for non-conformist preacher Rowland Hill (1744-1833). Despite being born into a life of privilege, Hill chose to become a field preacher, strongly influenced by Methodist ideas although still within the Church of England. He was a popular orator, good at reaching out to ordinary people with his ideas. But his controversial methods made him unpopular with the religious establishment. The Surrey Chapel was funded by his inheritance from his father Sir Rowland Hill. 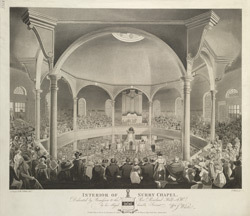 He drew congregations of up to 1000 people to his chapel. The chapel is no longer there and was destroyed in the Blitz.